Metal braces can be a nuisance between dietary restrictions and cutting your lips on the brackets. Depending on the length of treatment, you might have visible discoloration on the surface of your teeth, where your brackets were attached. Regardless of how many times you brush, floss or use mouthwash throughout the day, you will never be able to get your teeth fully cleaned with metal brackets. The wires will hinder proper flossing, which can lead to food particles remaining stuck between your teeth for longer periods of time. With Invisalign, the clear trays are removable, eliminating the dietary restrictions associated with braces and allowing you to fully clean your teeth after meals. With traditional braces, you’ll find yourself at the dentist every three to five weeks to have wires adjusted and brackets checked. Accelerated orthodontics requires fewer visits. 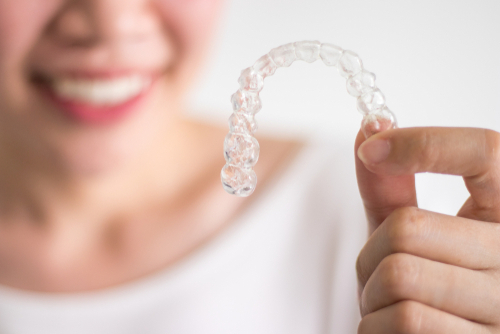 You will receive a series of aligner trays, that you wear 22 hours a day. These trays are replaced every 5-7 days depending on your individual treatment plan. During the first tray delivery appointment, Dr. Berik will use her BAM technique to start the acceleration process, encouraging bone movement and the quicker shifting of your teeth. The process is painless and does not involve any downtime, allowing you to resume your day as soon as your appointment is complete. Shorter Treatment Time = Faster Results! Another option for acceleration that Dr. Berik uses is the OrthoPulse device. This acceleration method is done daily at home. For 10 minutes per day, you will need to wear the OrthoPulse mouthpiece which emits ultra high-frequency light. The light encourages movement in your teeth, accelerating the shift. This will cut the treatment time down, giving you your perfect smile in a few short months. If you are interested in learning more about accelerated orthodontics or scheduling a consultation, contact Newton Dental Associates today! We will be able to design a treatment plan that fits your needs. Newton Dental Associates can be reached by calling 617-965-0060 or filling out our online contact form.